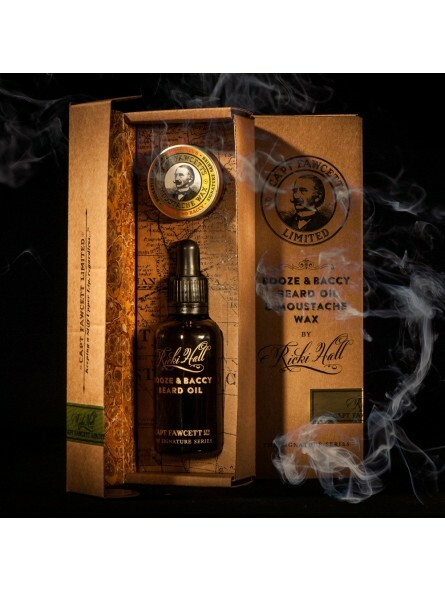 Captain Fawcett Ricki Hall Booze & Baccy Beard Oil 50ml & Moustache Wax 15ml Gift Set. Captain Fawcett collaborate with the World renowned Dandy & Gentleman about town Mr Ricki Hall in concocting this simply delectable bespoke Beard Oil. Captain Fawcett Ricki Hall's Booze & Baccy Beard Oil 50ml. A rich and complex blend of essential oils which combine the luxurious base notes of honeyed fresh tobacco leaves, dusty aromatic frankincense, maple-like benzoin, woody oak mossand warm exotic vanilla bean, layered with mid notes of fresh hops and sweet bog myrtlefinished with the top notes of spice from the bay rum tree and zesty orange. 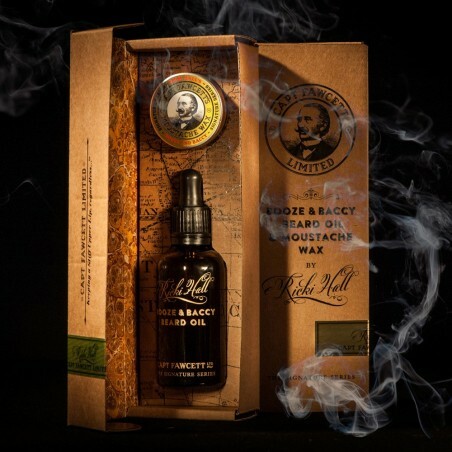 Ricki Hall Booze & Baccy Moustache Wax 15ml. A rich and complex blend of beeswax and essential oils combine to create luxurious base notes of honeyed fresh tobacco leaves, dusty aromatic frankincense, maple-like benzoin, woody oak moss and warm exotic vanilla bean, layered with mid notes of fresh hops and sweet bog myrtle finished with the top notes of spice from the bay rum tree and zesty orange.